Quinn Roux and Ultan Dillane have both put pen to paper on new two-year deals. 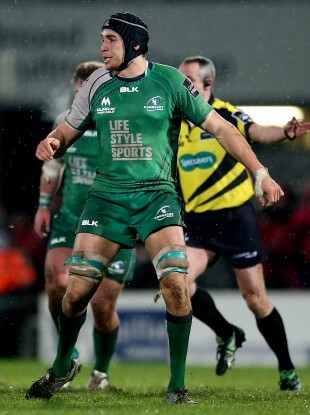 Dillane made his first-team debut in December against Leinster. CONNACHT HAVE REINFORCED their second row options by tying down Quinn Roux and Ultan Dillane on new two-year deals. Both locks will remain with the western province until at least the summer of 2017. South Africa native Roux joined Pat Lam’s squad on a loan deal from Leinster this season, having originally moved to Ireland in 2012. The 24-year-old struggled for extended game time at Leinster, but has thrived under Lam since his switch. Roux’s contract was set to expire at the end of the current campaign, but Connacht have acted to ensure the former Stormers second row stays in Ireland for another two seasons. Residency rules mean 6ft 5ins Roux qualifies to play for Joe Schmidt’s Ireland in August of this year. Meanwhile, the new deal for 21-year-old Dillane speaks volumes of the potential the former Tralee RFC man possesses. The French-born lock has made four appearances for Connacht in the last two months, including a first start against Ulster in December. Having originally come through the Youths system in Munster, Dillane was picked up by the Connacht academy and developed under the tutelage of Nigel Carolan. An Ireland international at U18 and U19 levels, Dillane is now learning swiftly from Connacht forwards coach Dan McFarland and will move onto a senior contract next season. “As a coaching team, we are very excited to have both Quinn and Ultan staying with Connacht for at least the next two years,” said Lam. “They are both young, abrasive locks who have real physical presence. I believe with continued game time and exposure at this level, they have the potential to play for Ireland in the near future. Quinn is someone who has impressed us all massively since he came in during the summer. His work ethic and desire to succeed on and off the field was apparent from day one. He has fit in extremely well with the rest of the squad and I know our supporters have really embraced him as well. “It’s a very important part of our vision and succession planning to have players coming through from the Academy. Ultan is someone we have watched develop under the guidance of Nigel (Carolan) and Jimmy (Duffy). Email “Connacht have secured the futures of two promising young second rows”. Feedback on “Connacht have secured the futures of two promising young second rows”.